From Doug & Val -- Together we have crossed the Indian and Atlantic Oceans five times, traveled by yacht many miles up the Amazon River, and explored remote archipelagos across the globe. During our voyages, we raised and home schooled our children aboard, and have enjoyed a life living beyond the limits and safety of the norm. Along the way we have developed an awareness, appreciation and respect for the ocean, the sky and the weather in all its diversity. Most recently, we have been reminded of the majesty of mother nature as we have sailed Gambit the 4500nm from Italy to the Caribbean, to replace our yacht Katlyn, destroyed by hurricane Irma. We would love the opportunity to extend a warm welcome to you in the BVI, offer you our hospitality aboard Gambit, and show you around some of our lovely anchorages and must see spots that we’ve come to call home. Doug, holds a Yachtmaster Offshore qualification, and is a charismatic, adventurous and attentive host, willing to go the extra mile to ensure you get the most out of your vacation. He may set the table with the cutlery back to front from time to time, or forget the salt and pepper, but will make up for it with his enthusiasm, knowledge and dedication to sailing and water sports, his captivating story telling and his sense of humor. 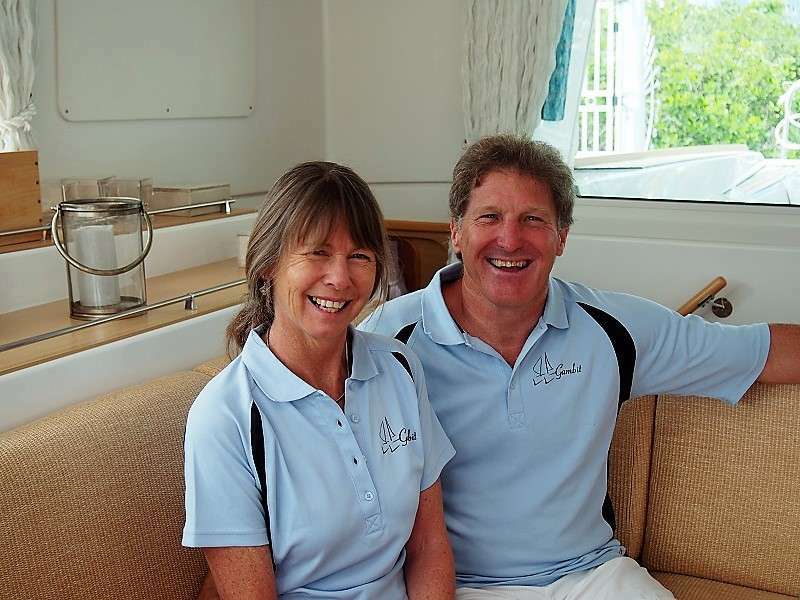 Val, with her attention to detail, takes care of your culinary delights and comfortable, well appointed accommodation, as well as assisting Doug with the sailing. Val may ‘miss the buoy’ occasionally, but as a partnership they support and enhance each other to provide you with a relaxing, carefree yet attentive experience you are sure to remember for a lifetime. Food is always a significant aspect of any vacation! On Gambit we aim to provide our guests with attractive meals which are both appetizing and nutritional, whilst accommodating your dietary requirements, likes and dislikes as best we can. We focus on preparing meals with a combination of locally obtained produce such as fresh fish, chicken, meat, tropical fruit and vegetables, rather than importing exotic ingredients and out of season foodstuffs. We serve breakfast, a light lunch and dinner in the cockpit or at the saloon table, with chilled water, fruit juice, tea or coffee to accompany it. In addition we have our ‘Captains Bar’, providing you with that perfect glass of chilled wine, a cold beer, a selection of standard spirits and mixers, or a sundowner cocktail. Pork tenderloin medallions flambéed and served with a creamy Mount Gay Jamaican Rum sauce and a in season roasted veggies. Barbecued tuna steaks marinated and served with a sesame ginger sauce, and couscous tossed veggies.